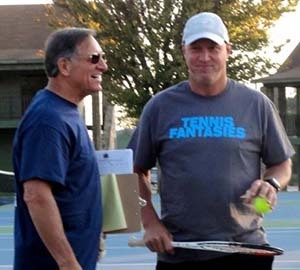 Tuesday at Tennis Legends week is when the competition really starts. The week is rarely won or lost on this first day, but a lot of the assumptions that Coaches Newcombe, Stolle, Emerson, and Davidson have made about us—specifically where we belong in the singles and doubles line-ups—are first shown to be either genius or rubbish. Given that the sun is shining, the temperatures are drifting towards the low 80s, the winds are light, and we’ve had a day and a half of practice and conditioning, nobody’s got much of an excuse. Dunnie coach Fred Stolle and player Tony Huber developing strategy. Jim was, per usual, all business on the court. And I was bit dumbfounded, as his 6-3 first set win would attest. I pulled myself together, calmed down and found my forehand to build a commanding lead, and hung on for a 6-3 second set in my favor. Then came the dreaded supertiebreaker. Two years ago, I’d tied a Legends Week record—two supertiebreaker losses in the same day, the first coming as the indirect result of an unforgettable net cord winner by a 20-plus-years-younger kid named Rory Springfield. Apparently Rory can’t forget either; he wrote, yesterday, “glad to hear you’re back out there and love reading your blog, go get um this week and sorry I couldn’t be there to join you…GO GIANTS.” Thanks, Rory, and I mean this in the most collegial and team-building way: eff you, GO ROYALS!” I’m not kidding, Rory. Unless we’re on the same team down the road. Then … I love you, man. Back to this year. And—I probably don’t even need to tell you this—at 7-9, during an exchange I felt in complete control of, the Wanker’s weak backhand hit the top of the net, and trickled over without even a bounce. Game, set, and match. I reached out to shake Jim’s hand, and he hugged me. So one of us felt pretty good (unfortunately, 24 hours later, he tore his calf muscle in a match he led 6-0, 2-0, and decided to head home early: ave atque vale, worthy opponent). Organizer Steve Contardi and rookie Legend Luke Jensen. It’s nice to have a brace of Jensens on hand. 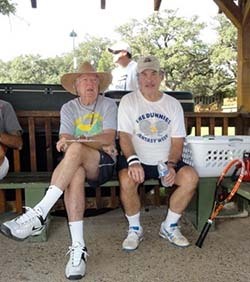 At lunch, my friend Professor Lipsick and I noted that on the courts the friendly camaraderie had turned to something slightly more intense. “I remember something assistant coach Ross Case told me my first year,” Joe said. “I had been generous, as he might have put it, with my line calls. If it was questionable I would always call it good. Ross was watching my match and finally walked over in frustration. ‘Mate,’ he whispered loudly, ‘we’re not here to win the sportsmanship award.’” This came to mind in the afternoon doubles. Coach Stolle has paired me with our assistant trainer Jason Palmenteer, a very good athlete, tall, lanky and—most important—young, but only an occasional tennis player. Jason, whose full-time job is in Florida at Nova Southeastern University, had a reputation for inconsistency and wildness in his game. Stockton, for some reason, thought I might be a calming influence. I thought I would probably introduce him to net-cord losses. 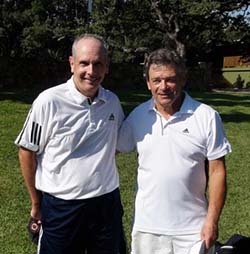 Our opponents—Bob and Tony—were wily veterans with lots of spin and slice to their games. Tony would later say he imagined that Jason would give them enough “free” points for them to carry the day. At 2-2 in the first set I began to worry, particularly after a close baseline call on our lob, and what I thought to be a very wrong call on my next serve. Amazingly, their coach Marty Reissen, watching from behind the fence, supported my objection, and Bob and Tony conceded the point. There were no disputed calls from then on, and we won 6-3, 6-0 behind Jason’s big, effective serves. Sadly there was little good news for our team. We’d led by a point after the morning singles, but were crushed by Emmo’s Wankers in the afternoon doubles. We may just be playing for pride going forward. Every morning begins with a clinic just as the sun is rising. 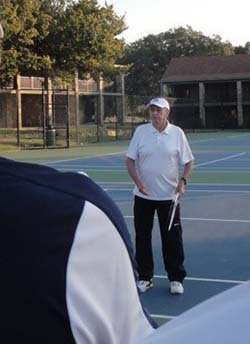 Here, Roy Emerson is explaining to bleary-eyed campers how to hit a better volley. One final Tuesday vignette: First: Every afternoon, after the doubles have finished, selected campers play “fantasy sets” with a pair of Legends. There are typically eight fantasy matches in the two hours before happy hour and the rest of us can either start drinking, go back to the room and nap, or attend a clinic focused on a certain stroke or match situation. Today, Emmo and Laver were scheduled to run a clinic on serving, but the Rocket didn’t appear until about 45 minutes after our start. By then, slightly annoyed, Roy was telling jokes about his mate, focused on the fact that his left arm was—in his heyday—about twice the size of his right arm. “His wife Mary and Rocket couldn’t sleep in the same bed,” Roy insisted, “because when he’d turn over in his sleep, his left arm would knock her out. And you couldn’t serve him champagne, because he’d break the glass trying to hold it.” Of course, when the Rocket showed up, all was forgiven. “I was so impressed watching all your matches today,” he told us. “When I saw you yesterday, I didn’t realize any of you could be bothered to run. But now, when you did, I can see you know how to play pretty well.” Some might call it damning with faint praise, but he said it so gently, almost sweetly, that it didn’t sound faint at all. On to Wednesday. Thanks for keeping us all us wish-we-were-there guys posted, Terry. Say hi to Murphy for me.